From Powell Brewery in East Vancouver comes their “5th Anniversary Ale” a Hazy IPA aged in Pinot Noir Barrels with Brettanomyces for 6 Months. The beer pours a cloudy orange colour with a white head. The aroma consists of brett funk, floral hops, pinot noir and oak from the barrel aging. The flavour is of brett funk, citrus rind, tropical fruit, melon, pinot noir, oak, resin, yeast and bitterness. The alcohol content comes in at 7.6%. This is a definite winner of a beer and very worthy of being the 5th Anniversary beer! Commercial Description: Our 5th Anniversary beer features new and old world techniques. Starting with a Hazy IPA, agin it for 6 months in Pinot Noir barrels with Brettanomyces, and finally dry-hopping it with Ekuanot Cyro hops just before bottle conditioning. Barnyard brett meets hazy IPA. 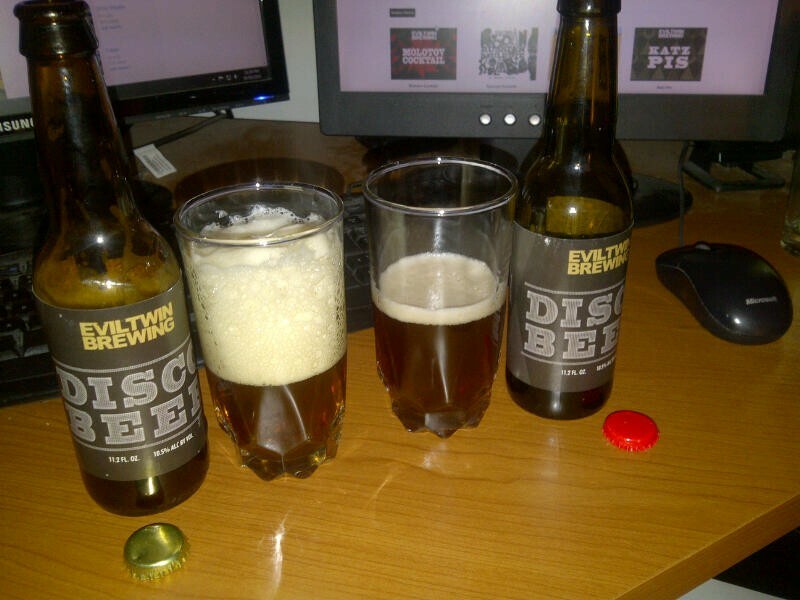 From Copenhagen Denmark’s Evil Twin Brewing (brewed at the Brouwerij De Molen, Bodegraven, Netherlands) comes their “Disco Beer” a double IPA. The disco beer is usually aged in white wine chardonnay barrels but there was also a special batch brewed using red wine chardonnay barrels. This post will rate them side by side! The only way to tell the two different beer apart before cracking the beer open is the colour of the caps. The cap colour is fairly self explanatory although the bottle does not hint at this at all! First up is the Original White Chardonnay barrel aged version. This beer pours a copper colour with a huge explosive head that builds and builds! The aroma consists of malts, woodiness, mild pine, white wine and floral hops. The flavour is of malts, floral hops, pine, white wine and some woodiness from the barrels. This is a pretty nice although different double IPA. Next up is the red wine chardonnay barrel aged version of the beer. This beer pours a cloudy copper/orange colour with a small red tinged white head. The aroma is of malts, sweetness, red wine, woodiness and dark fruit. 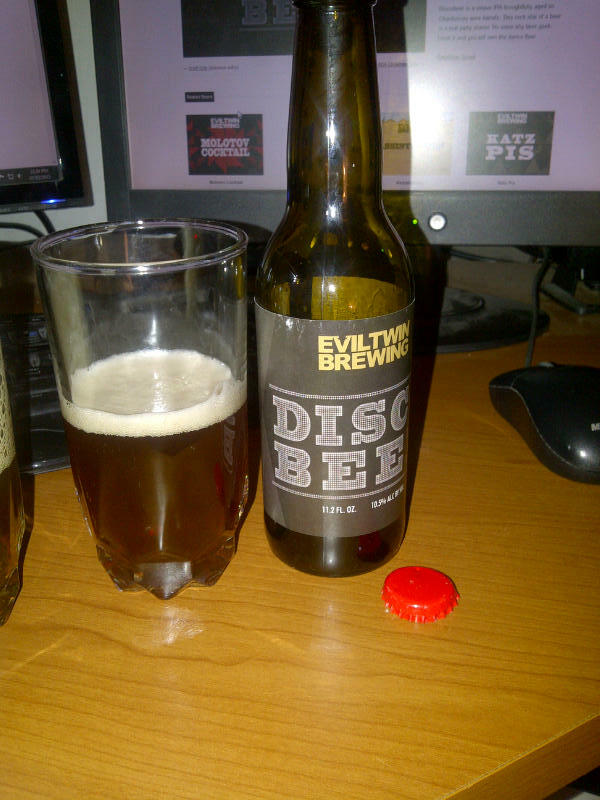 The flavour consists of very sweet malts, hops ,red wine, woodiness, nuts and dark fruits. This may be a double IPA but it sure tastes like a barleywine! Both beer drink very differently and would not be recognizable side by side! One tastes like a double IPA and one tastes of a Barleywine. I love how much a change in wine barrel and some malts can completely change the aroma, flavour and complexities of a beer! As I like both barleyines and double IPA’s I can not pick a favorite. The alcohol content of both these beer is 10.5%. If you are looking for an IPA go for the regular cap but if you want to play a bit go red all the way! 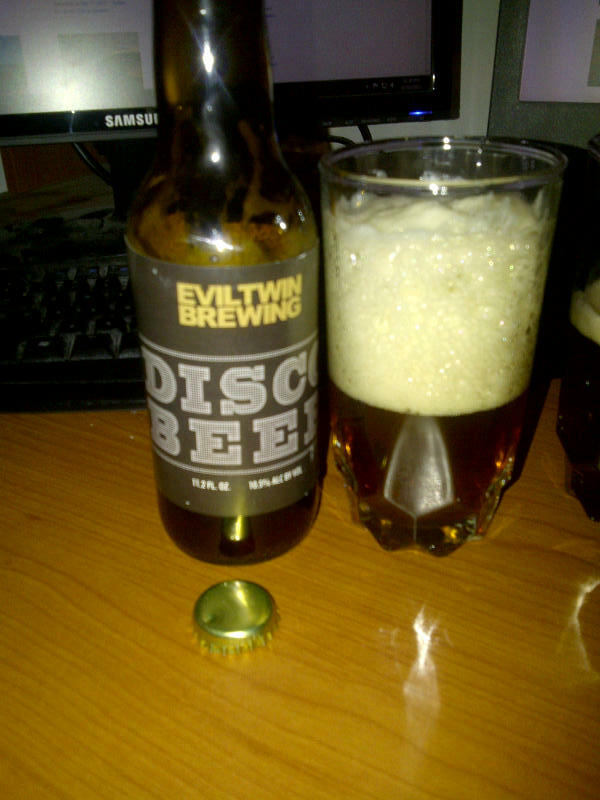 White Version: Discobeer is a vinous IPA thoughtfully aged on Chardonnay wine barrels. This rock star of a beer is a real party starter. No more shy beer geek. Drink it and you will own the dance floor. Red Version: Special version of our infamous Disco Beer, this time brewed with a slight darker malt profile and aged on Chardonnay red wine barrels instead of the usual white wine barrels.